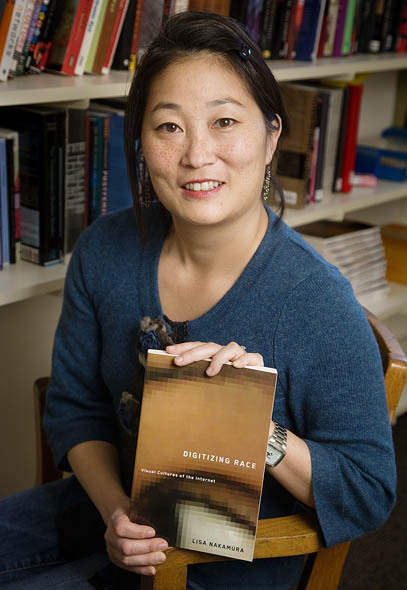 As part of a Bates College series exploring the impacts of social and technological progress on concepts of race, author Lisa Nakamura offers a lecture at 7:15 p.m. Thursday, Dec. 2, in Pettengill Hall’s Keck Classroom (G52), 4 Andrews Road (Alumni Walk). Nakamura’s lecture, titled Antisocial Media: Understanding Racism and Homophobia in a Digitally Connected World, will address social media’s influence on concepts of race and homosexuality, and will touch on the recent suicide of Rutgers first-year Tyler Clementi. The talk is the first public offering in the series Race in a Post-Human World, which explores the collapse of social categories caused by advances in technology. Sponsored by the Bates College Lectures Committee, the series will include two more lectures and a dance performance, all of which will be open to the public at no cost. For more information, please contact jgovinda@bates.edu. Post-humanism is a term expressing what many believe is our current condition as human beings. Thanks to technological advances — such as medical interventions like smart prosthetics and implanted defibrillators, and human-emulating capabilities such as artificial intelligence — the old boundaries between animal and machine are increasingly blurred. Similarly, post-humanism challenges long-held notions of other categorizations of humanity such as gender, race and species — making post-humanism a concept that is highly controversial, but extremely idea-rich across a wide range of academic disciplines. Nakamura is the director of the Asian American Studies Program and Professor in the Institute of Communication Research and Media at the University of Illinois, Urbana-Champaign. She has published numerous books including Digitizing Race: Visual Cultures of the Internet (University of Minnesota Press, 2007) and Cybertypes: Race, Ethnicity, and Identity on the Internet (Routledge, 2002). The series continues in 2011 with the lecture Ring, Ring, Ring: Popular Music and Mobile Technologies by Alexander Weheliye, associate professor of English and African American studies at Northwestern University, at 7:15 p.m. Monday, Feb. 14, also in Pettengill Hall’s Keck Classroom. Weheliye teaches courses in African American and African diaspora literature and culture, critical theory and popular culture. He is the author of the book Phonographies: Grooves in Sonic Afro-Modernity (Duke University Press, 2005). Alondra Nelson, associate professor of sociology at Columbia University, offers the lecture Roots Revelations: Genetic Ancestry Tracing and the YouTube Generation at 7:15 p.m. Thursday, March 3, again in the Keck Classroom. Nelson specializes in race and ethnicity in the U.S.; gender and kinship; sociohistorical studies of medicine, science and technology; and social and cultural theory. Race in a Post-Human World concludes with a performance by acting director and assistant professor of dance at Bates, Rachel Boggia. Her performance, In the Very Eye of the Night, takes place in May (date TBA) and is conceived and directed by Marlon Barrios Solano, a Venezuelan dance and new media artist, teacher and researcher. Boggia, who has been on faculty at Wesleyan University, Dickinson College and Ohio State University, specializes in multidisciplinary collaboration with scientists, dance documentaries and multi-media performance.